I’ve said it before, but Mr. How Sweet could eat the exact same thing everyday for the rest of his life. This was the case before I entered his life and led him into the light. I still have visions of plain ground turkey and stinky egg whites dancing in my head. I love getting feedback from my recipes. Whenever I make something new, I grill Mr. How Sweet for about 10 minutes. I won’t lie – it drives me crazy that he is a man of few words. Except when I want to talk about myself. Which is all the time. The honey ginger chicken nuggets and buffalo chicken fingers have been such a hit in our house, that I couldn’t wait to try a new combination. ‘Uh huh,’ he says with a mouthful of food, eyes glued to the TV. ‘Yes, it’s really good,‘ still staring at some terrible show on horse racing. This is about the time that Mr. How Sweet picks up his plate and moves to a different location. I have no idea why he would do that. Truth be told, the safest place for him is in the coat closet. I’m afraid that there are monsters in there. Combine buttermilk and BBQ sauce in a baking dish. Add chicken to buttermilk. Marinate for 2 hours or overnight. 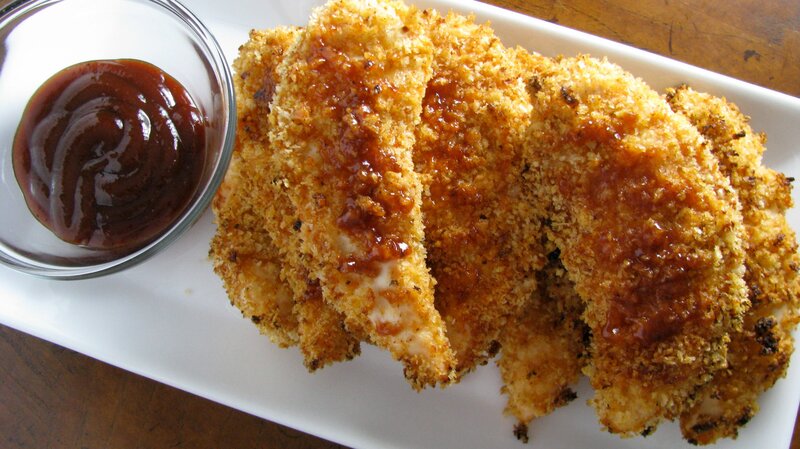 Combine panko, BBQ seasoning, garlic powder, salt, and flour in a large bowl. 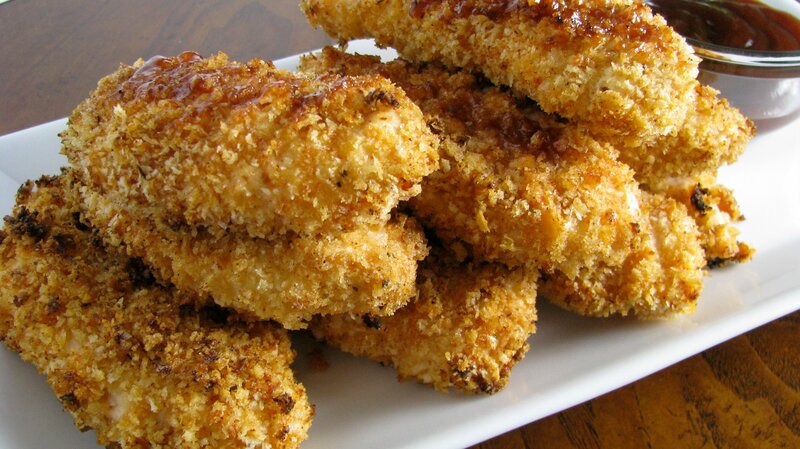 Coat chicken pieces in panko mix, then lay on a wire rack sitting on a baking sheet. Continue with remaining chicken pieces. Spray each pieces with cooking spray or olive oil. Bake for 10-12 minutes, flip, coat with cooking spray, and bake for another 10-15 minutes. When finished, brush with BBQ sauce. These chicken fingers definitely rank up there with the honey ginger chicken. But don’t ask Mr. How Sweet. He will just tell you that they are. . .good. Lol I love it! When I make something new or even that I’ve cooked before I grill my bf too and am never satisfied if the answer is just ‘it’s good’! I obsess too much and ask a lot of questions, so much that he is often finished way before me and I’m still chomping away! I love your writing style and you always make me laugh! This has to be a guy thing! I only get feedback if he doesnt like it. him: not like i remembered it. me: how so? what’s different? how was it last time? better or worse than you remember? him: i don’t remember it last time, but the name made me think it would be breaded chicken… italian chicken tenders.. you know? me: what?! how can it be different than last time if you don’t even remember last time?! and when do i ever bread anything?! hmmphh! me: well – do you like it? Biz: Quinoa meatballs with spaghetti squash! Oh these look sooo very good! I love this recipe or at least the pictures. LOL! And my oh my this chicken looks good. I’m such a sucker for crispy, breaded . . . anything, really. I have the same conversation with my hubby any time I make anything new :-) Hehe!!! Gosh, what would Mr Sweet DO without you? He would be the most boring eater ever without you…what a sad way to live! these sound so good. Crispy and BBQ already rings something pleasantly lickalicious to me! I just stumbled across your blog and I’m officially hooked! Mmm, I wish I had a plate of these right now. Yes I know it’s 9:30 in the morning. But after seeing these I am soooo hungry!! Hahaha I had great fun reading the post, and all the comments. Seems you’ve written the story of all our lives :) This looks delicious. What can I use instead of the BBQ seasoning? We don’t get that here! You could do a mix of garlic powder, onion powder, paprika, and cayenne? I made this for my BF and he loved it. I make him look at your website with me and send him e-mails of food. Your recipes strike that ever so hard to reach balance between healthy and still really great!!!!!! LOVE THIS!!!! I just tried this recipe and since I didn’t have barbecue seasoning on hand, I decided to experiment with the flavors. I followed your recipe exact except I used Caribbean Jerk seasoning and marinated it for the 2 hours. It was fabulous!! I just found your blog (through TasteSpotting) and I love it! I made the BBQ chicken fingers and they were delicious! I can’t wait to make your tribute to Elvis bars this week! I just wanted to thank you for such a DELICIOUS recipe!! I made these last night and am officially in love! Made these last week, and we LOVED them! I didn’t have any of the BBQ seasoning mix so I substituted some onion powder, smoked paprika, and cayenne pepper (in addition to the garlic powder and sea salt already in the recipe). We will be making these again and again. Thanks Jessica! I’m pretty sure these chicken fingers have the ability to save my marriage when I buy too much. he is one lucky guy! Those look amazing! LOL!!! you sound just like me when i make something new~~Rob gets grilled and questioned to the point he hopes that i never make anything new again!!!!LOL!!! i am gonna try these this week!!! Pingback: Keeping up with the Johnsons » Blog Archive » Friday. I enjoy reading your writings, looking at the food pics pics and reading the recipes. I laugh out loud, literally!